I found something to do with all those empty wine bottles and growlers. 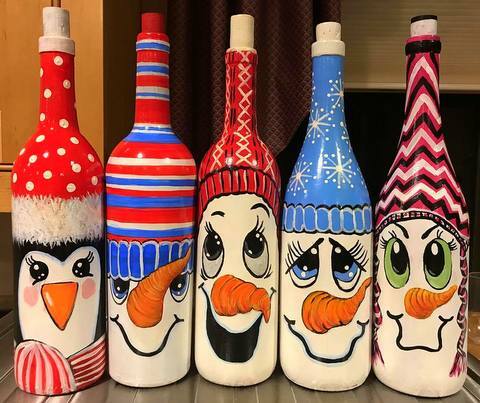 Plan to attend the snowman and penguin bottle painting class. Local artist and educator Kathy Smith will demonstrate in easy to follow directions on how to create your own bottle “Masterpiece”. No artistic ability needed for this class. Included are all supplies. So grab some friends and let’s paint bottles together. Wine Bottle is $24 and Growler is$29. A growler is a glass jug used to transport beer.